The Cleveland Cavaliers evened their first-round playoff series against the Indiana Pacers Wednesday night, thanks almost entirely to a Herculean effort from LeBron James, who went for 46 points in the win. 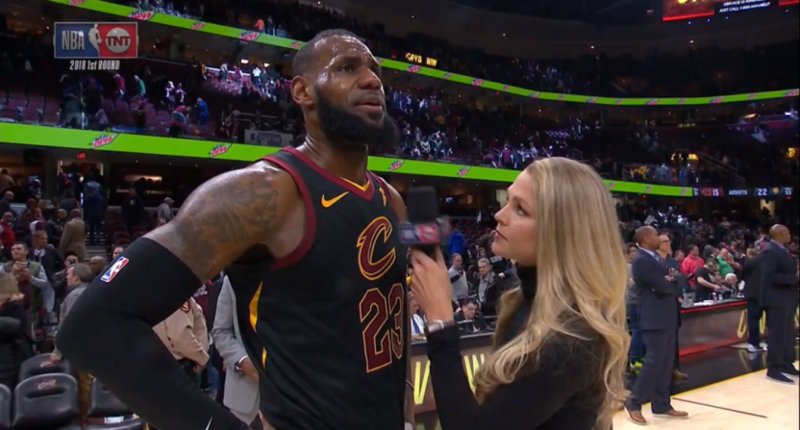 Naturally, Allie LaForce had LeBron for the post-game interview, and though it started with the usual questions about the game and how it had played out, the closing question was about the passing of Gregg Popovich’s wife, Erin, news that had broken during the game. Watching live, it seemed like a tonal shift, and perhaps a bit unfair to LeBron. That was certainly my initial reaction, and a good selection of Twitter’s as well. It felt exploitative at best, and offensive at worst. Tough to ask LeBron about Pop’s wife in that moment. The key to a good sideline interview is … informing people that someone died? It’s important to remember, though, that we don’t always get the whole story. According to some on Twitter, a different feed showed LaForce prepping LeBron for the subject, which would indicate we didn’t see her give him the news live on air right after a game ended. if you watched the live feed from the NBA app you can see she broke the news to him before the going live on TV. They continued to talk about it before going live. So that changes the tenor of the reaction at least slightly, as it means we didn’t actually see LeBron find out live. It also means LeBron theoretically had a chance to refuse to talk about it. However, why put him in that position at all? Whether it was LaForce or a producer, it felt wrong. Post-game interviews are a great time for raw reactions to what just happened on the court. They reveal athletes in ways we might not get to see otherwise, which a big part of the joy of watching sports. But when the questions are on off-court topics they can’t possibly have prepared for, even with a few seconds of prep, and especially when the subject is tragic? That’s likely going a bit too far, as the reaction has shown. The world could have waited until the press conference. At halftime of the Minnesota-Houston nightcap, Ernie Johnson confirmed that LaForce informed LeBron ahead of the interview and asked if he wanted to comment, as mentioned above. LeBron has also confirmed he knew the question was coming, as previously mentioned in the post.